Part of my work at the Gardens involves finding creative ways to highlight our herbaria, or dried plant and fungal collections, often through writing. One morning, I decided to highlight our collections’ evergreens. Wondering which of our evergreen specimens I should undertake, I thought about an embroidered pillow I once saw that read “Balsam fir – the friendship herb.” I opened SEINet (a plant collections portal), selected KHD, and typed Abies balsamea into the search bar. Considering that KHD is a relatively small and mostly regional collection, I was stunned when the search yielded an Abies balsamea specimen, in the form of a single branch, collected at Megunticook Lake in Maine, where I have stayed with my family nearly every August since I was born. 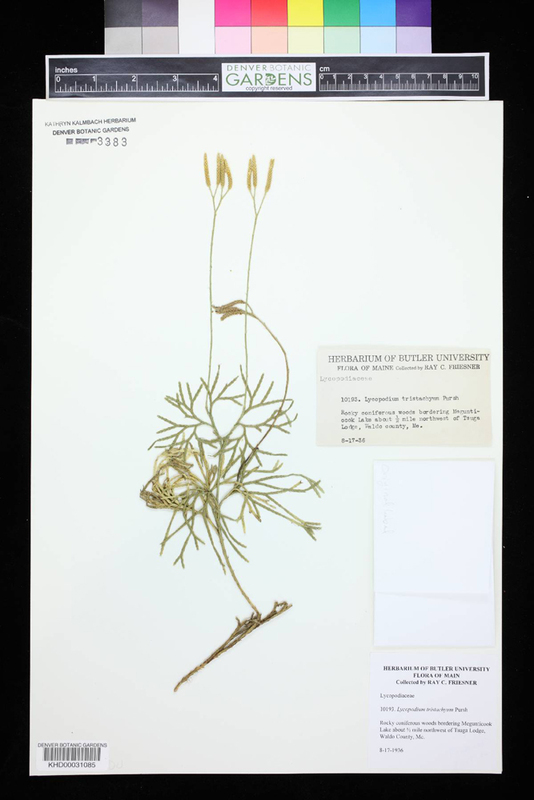 KHD, or the Kathryn Kalmbach Herbarium of Vascular Plants, is one of two herbaria at the Gardens, the other being DBG, or the Sam Mitchel Herbarium of Fungi. With 62,500 plant specimens in KHD and 18,400 fungi specimens in DBG, deciding which specimen to write about can be tough. I often find myself searching our collections through SIENet and MyCoPortal (a fungal collections portal) for species such as the tree I drive past on my way to work or the mushroom in my neighbor’s yard, wondering which specimens will inspire a story. On the morning that I discovered the Abies balsamea specimen collected at Megunticook Lake, I knew for certain that I had found one. 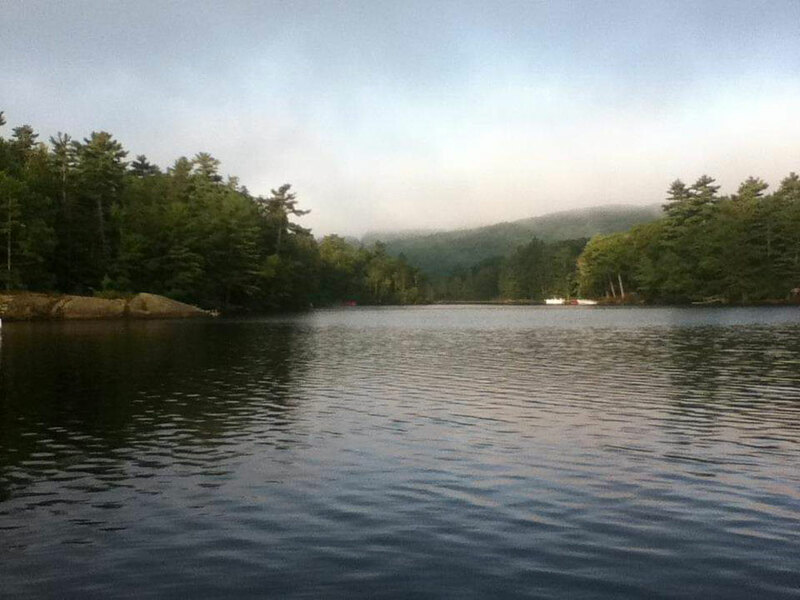 My family’s history with Megunticook Lake began in 1891 when my thrice-great-grandparents bought a summer house in the town of Camden which, within its limits, holds the southern half of the lake. In 1930, their daughters' family built a cabin, known to us as “the gray house,” on Megunticook’s southern end. My relatives came from Philadelphia and Pittsburgh to vacation at the gray house, the women and children staying all summer, their husbands joining them for a handful of days in August before all returned to school and work in Pennsylvania. 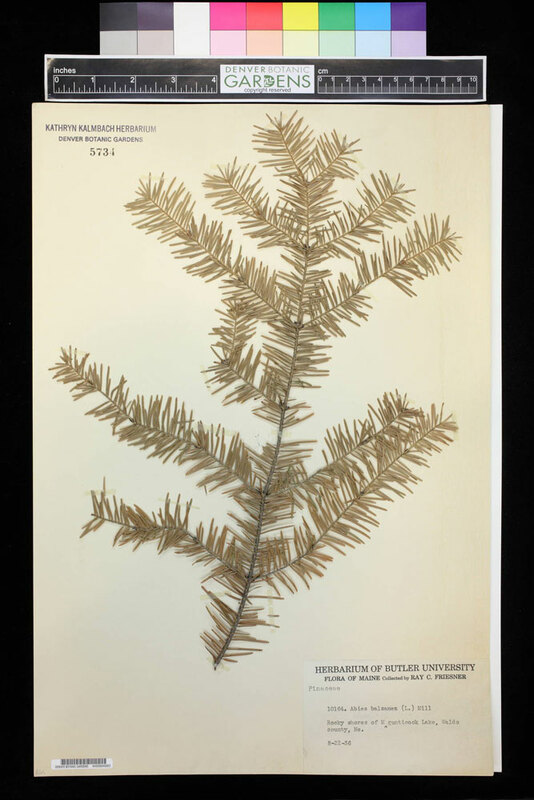 A closer look at the Abies balsamea specimen in SEINet revealed that the branch had been collected “north to Norton Pond,” at Megunticook’s opposite end, by botanist Dr. Ray C. Friesner in August of 1936. Searching by collector for Friesner, I found 11 additional specimens collected from Megunticook Lake and seven specimens collected from the town of Camden. With images of Megunticook Lake and Camden clear in my mind, I wondered what brought Friesner, who was the head of Butler University’s Botany Department, from his home in Indianapolis, Indiana to this corner of the world; if he had ever crossed paths with my family; and how his specimens ended up being housed at the Kathryn Kalmbach Herbarium, roughly 2,100 miles from their place of origin. Collection records from KHD and The Friesner Herbarium of Butler University (BUT) show that Friesner traveled from Indianapolis to Megunticook Lake nearly every August between 1933 and his death in 1952. Like my family, Friesner had a summer home in the area. He collected specimens from the surrounding trails, woods and shoreline as well as the nearby towns of Camden, Rockport and Franklin. Dr. Friesner collected a total of 25,500 specimens throughout his lifetime, most originating from Indiana, as it was his mission to collect and identify every species of plant previously unreported in the state. Of Friesner’s 19 Megunticook and Camden area specimens, 12 were collected within a mile and a half of the previously mentioned gray house and of the adjacent property my family owns and visits today. After discovering Friesner’s specimens in SEINet, I pulled a few from KHD to examine them in person. “D.U.” stamps around several of the specimens’ original “Butler University” labels suggest that they were donated to the University of Denver by the Friesner Herbarium before the entire DU plant collection was donated to the Gardens. When sharing images of the specimens with family members, still scattered throughout Maine and Pennsylvania, they commented that I was likely the only person, aside from Dr. Friesner, to hold them in my hands and know so much about where they came from. 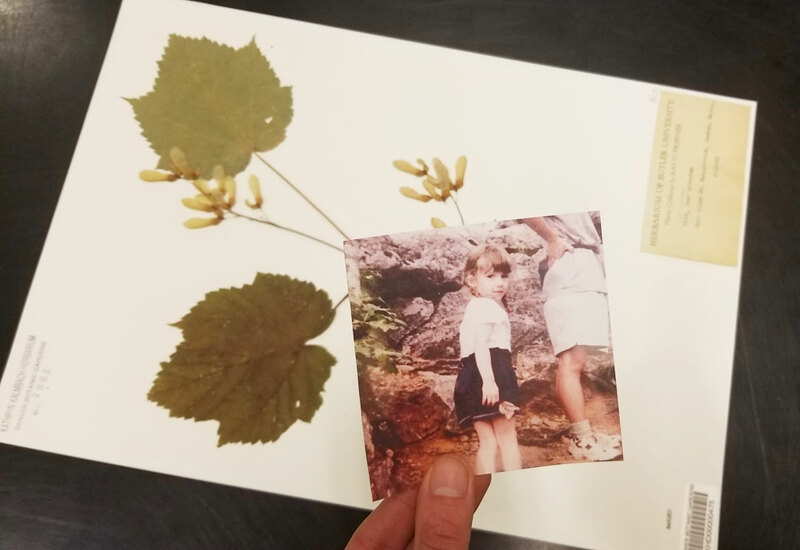 When I look at them, I am reminded of how far they and I have come from home and how wonderful it is that we have encountered one another in the Kathryn Kalmbach Herbarium. 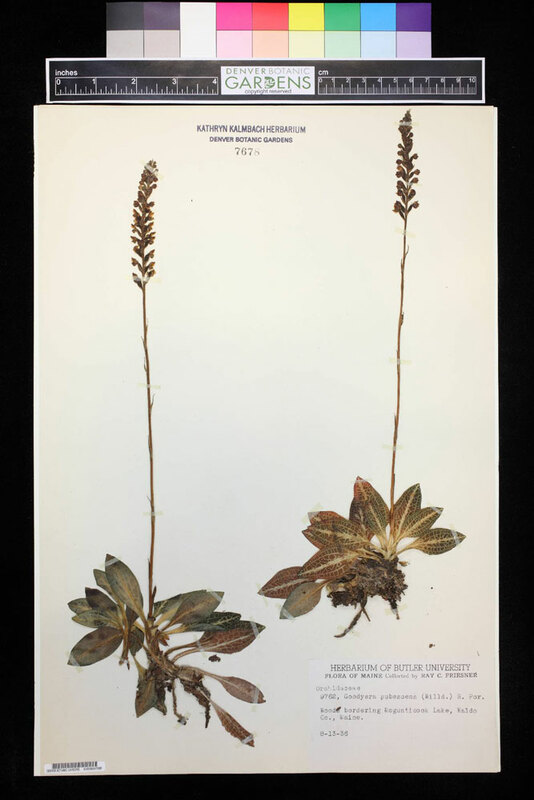 This experience has changed the way I search for and write about specimens in highlighting our herbaria, as I now realize that our collections have not only scientific value, but historical and emotional value as well. I am sure that the parallel histories of my family and Dr. Friesner are not the only stories told by our collections and encourage all to explore SEInet and MyCoPortal to see what significant specimens they can find – not only in KHD and DBG, but in herbaria across the country. Learn more about searching our collections and contact me, Stephanie White, at research@botanicgardens.org to tour our herbaria and see our collections in person. Loved the connection with Butler U. in Indiana & Maine! I grew up at Purdue and often wandered in the Horticulture Building and grounds during open houses...the old growth forest about a quarter mile from my home was a great place to explore and was a study site for university students. So glad to hear you connected with this story! I've never been to Purdue, but that sounds like a beautiful experience. You never know where you will find connections to your favorite places.